If you got ten minutes to spare then sit back relax and enjoy the charming magic of the late, great David Nixon, the Gentleman Magician who became one the most popular magical entertainers of his generation and was constantly on our television screens during the sixties and seventies. Here we see the man himself performing three tricks including a great version of 'Chase the Ace' with jumbo cards, and assisted by a very young Jimmy Tarbuck. This really is well worth a watch. As a magician I've seen some pretty magical amazing illusions in my time, but below are some Visual illusions that really are incredible. As you'll soon realize, our eyes easily be fooled. 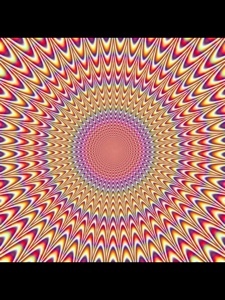 Or should we say our visual systems and our brains can be easily fooled because that is what is really happening. 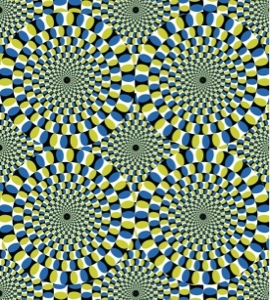 When you look at the photo's below you won't be experiencing an optical (eye) illusion, you are actually experiencing a “visual illusion” that is centered in the cortex in your brain – the area of the brain that processes visual information – and that has been tricked into seeing something that is not really there. Take a look at the two Visual illusions below and I think you'll agree that it's hard to believe that they aren't really moving, they are actually static images. It's not magic, it's just amazing. Share this with your friends and drive them crazy. Use the floating toolbar to the left.